It’s a fun time for nails! Nail art and nail stickers have made self manis way more interesting. I usually like to stick to one solid colour, but lately I have been mixing it up a bit with my feeble attempts at nail art. 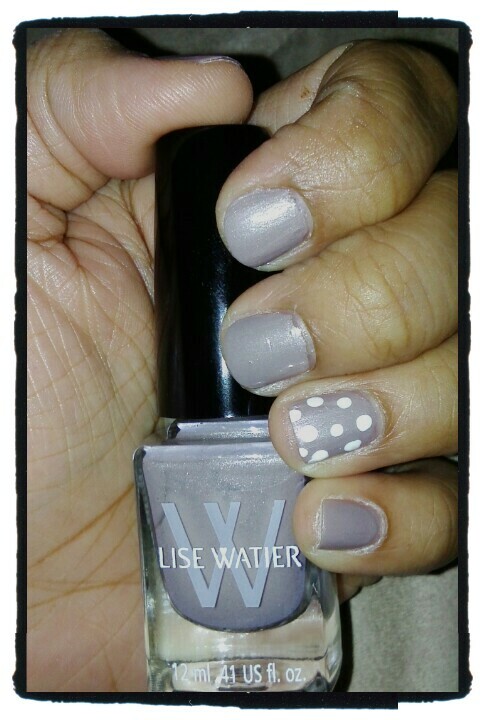 Pictured above is Lise Watier nail polish in Powdered Grey new for Spring! If you love a good neutral you will love this taupey-grey with a slight pearl finish. I used Avon’s Nail Art polish white and Avon’s double sided dotting tool to create a polka dot design on my ring finger. The dotting tool made it very easy to make the polka dots even with my unsteady hand. I assume you can create many more designs with this tool but for now this is as creative as I can get! Do you like nail art? Do you prefer to freehand it or do you use nail stencils and tools? Products were sent for editorial consideration and I truly love them. Oh that’s really cute! I just got a mark polka dot scarf that reminds me of this LOL! I have to admit – I’m not a fan of nail art. The most I would do is go over a “feature nail” with sparkles LOL!